DIN Standards are invented for a variety of components including industrial fasteners as DIN 1587 Acorn Nuts. DIN 1587 Nuts are also known as Domed Hex Cap Nuts. DIN 1587 Nuts are manufactured from Acid-Resistant Stainless Steel Grade A2 or A4, Brass, Alloy Steel, Ordinary alloy steel, Aluminium or many other materials. DIN 1587 Nuts are available in a wide range of sizes, shapes and materials. DIN 1587 Hexagon Domed Nuts have a threaded inner hole a special hexagon shape on the outside. Available with high and closed cap. The presence of such element provides protective properties and decorative properties. Galvanized, Nickel, Silver and Chrome plating available as per custom specified. Strength Class 5 and 6. 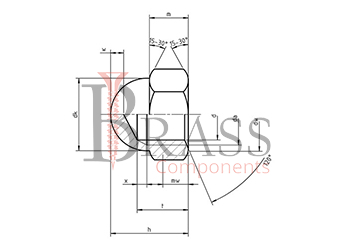 Complies with GOST 11860, EN ISO 4759-1 and EN 28839. Light, Rustproof, Good Wear Resistance and Low Co-Efficient of friction. To protect the element from corrosion of metal in high humidity conditions, a Special Galvanizing coating is used. Closed Structure protect the bolts and other fasteners from oxidation or corrosion which will allow Din 1587 Nuts to be used in aggressive environments. 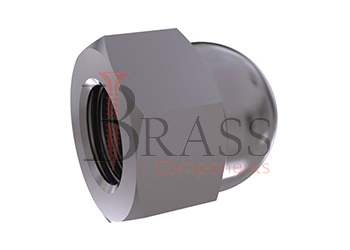 Also Available in High Nuts with an elongated Cylindrical Surface and a Hemispherical shape of the end part and with Rounded surface of the outer end. Anti-Corrosion Zinc Coating allows to be used in environments with high humidity. Designed to protect important threaded connections. Used to create an aesthetic appearance of threaded joints of conveyer lines, machines and equipment. Also used in food and medical industry, instrumentation and mechanical engineering. We manufacture DIN 1587 Nuts as per Custom Specification and export in Germany, Sweden, Denmark, Norway, Russia, France and other European Countries. For more Information, Please Contact Us or Inquiry Now.